I’ve been doing something very cool on Facebook over the last couple of months. It started out as an experiment but has worked really well, and has actually added significant numbers to my email list. 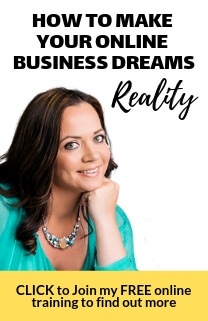 So today, I want to share with you a little of what I’m doing and why I’m so excited about it, and why I think this is something you can add into your online marketing mix too. So, it all starts with Facebook lives. If you haven’t heard, right now is a very good time to be doing Facebook livestreams. I love doing them, they are a brilliant way for me to engage with my audience and share myself and my online business experience with people from all over the world. I just use my phone, I do them from my kitchen, from a coffee shop, from the beach, in my office, in my lounge… They are live, they are raw, and they are real. Most of all they are fun. I’ll simply announce a topic and share some value on a topic that I know my Facebook fans and my email list subscribers have questions about. How do you choose the best Facebook Live topic for your audience? I survey my list and find out what people want me to talk about – I ask them about their challenges and how I can help them grow their online business. For example, I surveyed my list at the beginning of the year and I got the message loud and clear … “Bernadette, I want to know how to build my list”. So, I recently did a whole series on growing an email list, and throughout the series, over the five episodes that I did, I invited people to come and download the course notes. Well, the result was astonishing. People did come and join the series of Facebook lives; they came, they downloaded the course notes, and I added hundreds of people to my list. You do the work once and they just keep working for you. These Facebook lives stay in the Facebook feed. That means you can have content that’s out there, bringing people onto your email list, and it’s all happening in this, what looks like a live environment, but the video still runs and appears in the feed long after you stopped broadcasting live. I love it; that you do the work, you do it once, and then the work carries on doing the work for you afterwards. Now, this is my way of doing business! I really encourage you to check out this strategy for your own online business. How do you turn your Facebook LIVE posts into an effective list building strategy? You can do your Facebook live as a one time or you can do it as a series. I really enjoyed doing it as a series – have you seen my latest Facebook 5Lives series? I get raw and real; I love seeing people join and interact with me day after day. IMPORTANT: Make sure that you have some type of PDF or “freebie” download where people can access more information on your topic. This is the important list building part of the strategy. I give away course-notes. If people want the course notes, they can sign-up for them. During your live, add the download link to your Facebook live comments. Make sure that several times you do a call to action. Tell people who tune into your live, where to go to download the course notes. If you want to see me LIVE in action, feel free to come and join me on my Facebook page. Try it out in your online business then let me know how it works for you. You’re gonna be really pleased with how many people you’re adding to your email list using Facebook. Remember, there’s no time like the present, money loves speed. Go and put this into action now and then come back and let me know how you got on.